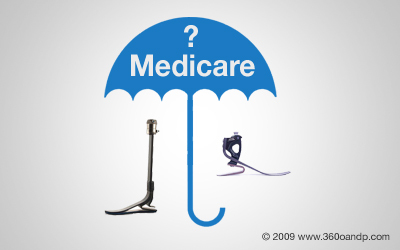 For the most part, Medicare provides excellent coverage for prosthetic services. Of course, that 20% coinsurance can really drain a beneficiary's saving's account. Many people assume, because they are on Medicare, the prosthetic coverage will be substandard. The opposite is actually true. Commercial insurance companies can impose a whole list of restrictive, and sometimes seemingly arbitrary, guidelines. Many commercial insurance companies will impose caps on care, allowing for as little as $1000.00 coverage for prosthetic items per year. Extremely large deductibles and exclusions for particular components or technologies, such as microprocessors, are also common. Medicare bases its coverage guidelines on medical necessity. If the need is legitimate, there is sufficient records supporting medical necessity, the device will realistically benefit the user, and the physician is on board, providers are generally in the clear. For the codes listed above, prosthetic providers cannot directly bill Medicare during a users Part A stay. This is included in Medicare's payment to the facility and the facility would be responsible for payment to the provider. Certain prosthetic components will only be covered for users with certain functional levels. Functional levels range from 1-4. An individual with no desire or potential to ambulate, or transfer only, would be a level 0. For a level 0, prosthetic components would not be covered. For an item like a FlexFoot, L5980, the user must be a functional level 3, or active community walker that walks at a variable speed over uneven terrain. · No more than 2 socket inserts (such as L5679 or L5673) can be allowed at the same time for a single prosthesis. · No more than two diagnostic (test) sockets (such as L5624 or L5620) will be considered medically necessary for fabrication of a single prosthesis, unless there is significant medical justification in the records to justify the need. · Some components, such as L5980 or L5631 cannot be used on an initial prosthesis. Unfortunately Medicare does not provide orthotic and prosthetic providers with pre-authorization or a pre-determination of coverage. That is why it is imperative that providers remain extremely familiar with Medicare guidelines. These guidelines can be found in the DMERC Supplier Manual.